If you are visiting Wilkes you may hear many of the locals talking about going to the Monday Cattle Sale. What they are really talking about is not buying cattle but rather the flea market that occupies a large field near the actual Cattle Sale. The Wilkes County Flea Market has been going on for as long as I can remember. The Wilkes Monday Flea Market has all kinds of stuff from food and plants to antiques and live animals; sometimes you can even find pony rides and live music! This is a great place to find good deals on all things especially produce. I like to go early in the morning and stock up on my veggies for the week. Be sure to bring enough cash to get what you want. If you are making a larger purchase some of the vendors may be willing take a check. Be prepared for the weather with sunscreen or an umbrella. Some of the vendors have booths and some setup tents but the market is mostly exposed to the elements be it rain or shine. The Wilkes County Flea Market is located on Orange Street, just before the VFW Campground in North Wilkesboro. Once you are on Orange Street you can”t miss the market parking area. Cars will be parked in a grassy lot alongside the gravel road. Just pick a spot and remember where you parked. If you are there on a very busy day you may need to park further away…possibly at the VFW. The VFW will sometimes charge a small fee for parking in their lot but it goes to a good group of people and is well worth it. The flea market itself is not immediately visible but you are sure to see people walking towards a row of tightly planted evergreens. A small stream runs along one side of the market and you will cross one of two small footbridges to enter. Then you can pick a direction and explore! 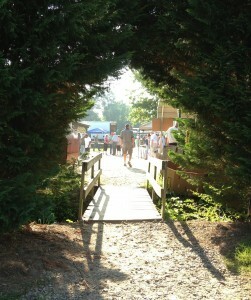 Don”t miss The Barn Yard Opry as you walk through the Wilkes County Flea Market!